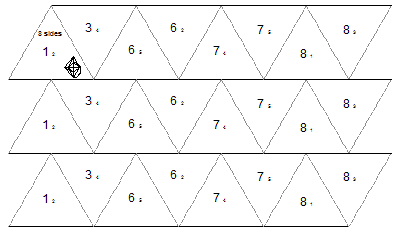 Note that, as with a traditional folding and the pinch flex, any time leaves are face-to-face using an interleaf folding, they will have the same number on them. 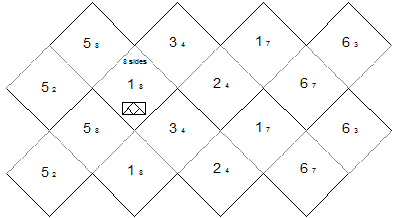 The main difference is that, instead of getting there by always folding adjacent sides together (where folding adjacent a's together may make it so b's are now adjacent), sometimes you must interleave different parts of the template in order to achieve face-to-face numberings. The first example is a 6 sided flexagon. Below is the state diagram for the point flexagon. It shows which sides are accessible from which sides. For example, the line from side 1 to side 2 means that you can flex from side 1 to side 2 and back again. The red dashed line indicates that the hinges from one side are nested inside the hinges for another side. 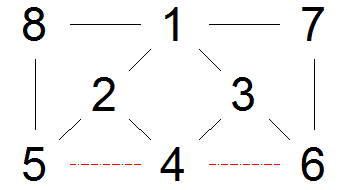 From this position, you'll find that anywhere there's a solid black line between two numbers in the above diagram, you can pinch flex to a state with one of those numbers on one side and the other on the opposite side. For example, the line from 1 to 3 means you flex to a state with 1 on one side and 3 on the other. 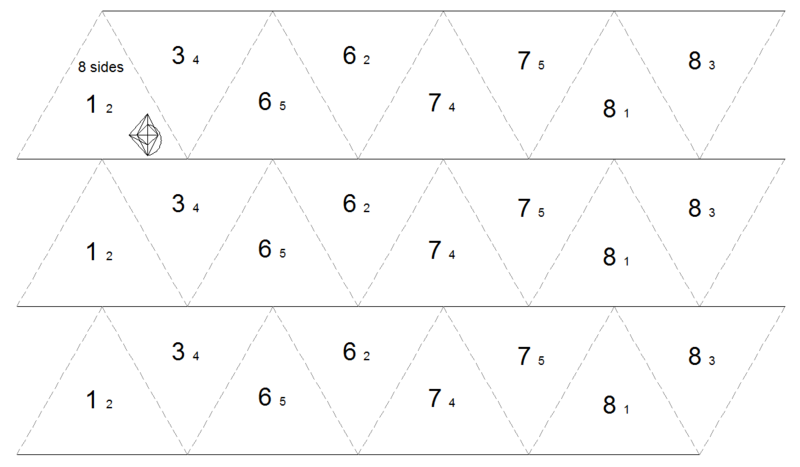 Lay one strip on top of the other such that the 1’s, 2’s and 3’s are back to back with like numbers. 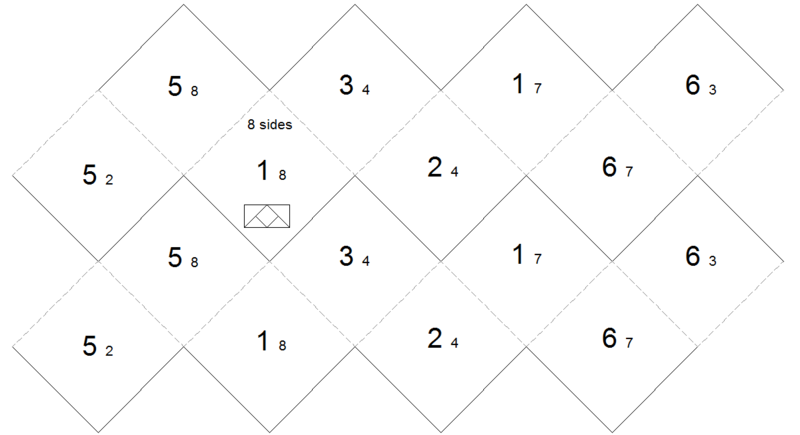 Next fold each of the adjacent pairs of 6’s against each other (as you would fold a trihexaflexagon). You’ll now have two pairs of triangles side by side that need to be taped together. From here you can flex between 4/5, 5/6 and 6/4, but no other states are accessible. The next example has 8 sides and lots of nested hinges. One of the interesting things about this pattern is that is has a doubly nested hinge between sides 7 and 8. 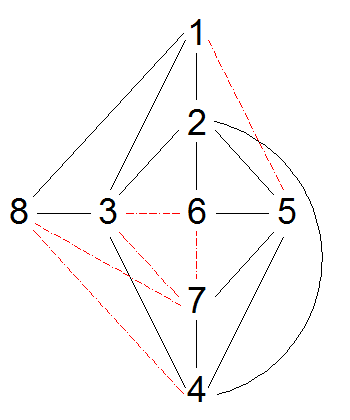 When you fold the edge flexagon such that sides 7 and 8 are opposite each other, you'll find that you've connected each sector back to itself. You have three independent loops interleaved together. Folding to the other states is equally tricky. 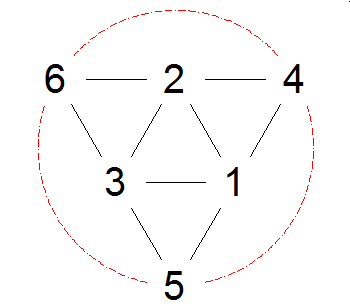 The basic approach is that you start by folding each of the three strips into a piece of the hexagon. You may need to temporarily fold non-like numbers together, but you'll eventually slide another piece in there so that all face-to-face numbers match. It's interesting to note that the state diagram of the edge flexagon using the pinch flex is fully predicted by the state diagram of the corresponding point flexagon. All transitions not involving nested hinges can be pinch flexed to if you fold to one of those states. Any transitions involving nested hinges require taking apart the flexagon and reassembling it using an interleaf folding.